Dragbike.com roving reporter, Tom McCarthy visited Timblin Chassis in Baxley, GA. Tom spent a little time with chassis maker Walter Timblin, to give Dragbike.com readers a sense of what it’s like there. Many motorcycle drag racers would love to own a Dragbike created by Walter. He’s created hundreds over the years, so here’s a little 411 on the chassis-master: Walter Timblin. Walter started off his welding and fabrication education a few decades ago, cutting his teeth on the world of X-ray quality welding in the Nuke industry. He was not only a certified union welder, but a weld inspector too who made sure the tradesman on a job stated to industry standards on AWS, American Welding Society jobs. As a welder, Walter has spent thousands of hours under the helmet and as a welding inspector, believe me – he knows what he’s looking at. As a drag bike pilot, Walter used to haunt the tracks in the South Eastern USA, large and small. 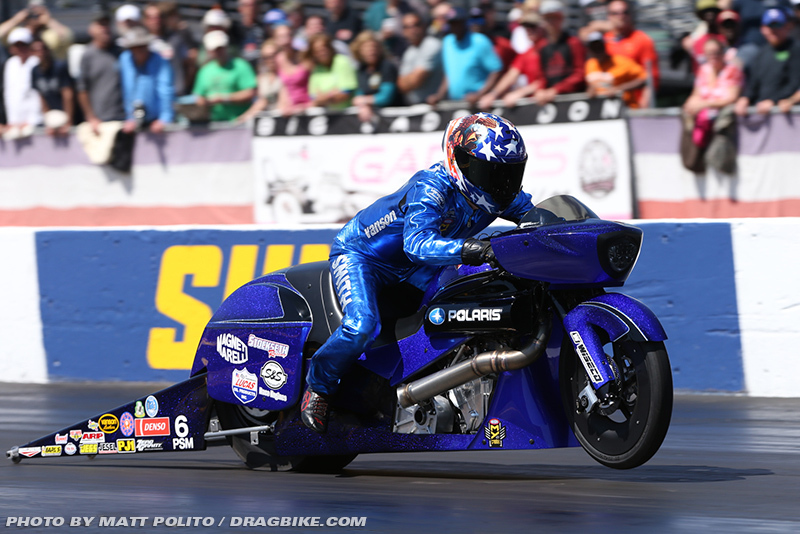 His partner in crime, back in his drag bike racing days, was none other than John Davis. Walter raced his share of sportsman class bikes in the early 1990’s and in 1994, he built himself a Top Gas bike and a Funny Bike for his friend, John Davis, back when John’s son, Travis, was a little guy. Which is mighty interesting when you consider now some decades later, Travis Davis is a professional motorcycle drag racing champion in his own right: piloting a Timblin Chassis, just like his daddy before him. 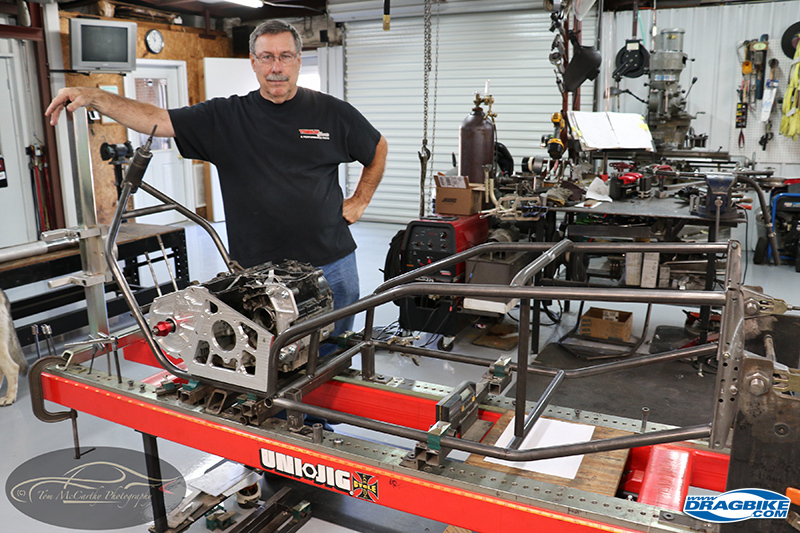 Walter Timblin is a busy man, and from this chassis jig he earns his living. Since Walter’s earliest days as a drag bike chassis maker, he has not kept a frame-by-frame written log of every bike, but over 90% of the bikes he’s built, he can tell you who he built bikes for and even if they were sold off, who owns the bike now. As of 2017, Walter is sure there are at least 200 or more Timblin chassis out there in the hands of racers, across the globe. While Walter has made drag bike chassis for racers in Top Gas, Pro ET, Funny Bike, Outlaw, NHRA Pro Stock, Pro Mod and Pro Extreme, he’s best known for his Pro Mod bikes. He’s made no less than 60 of them and he’s seen more than his fair share of championships won by racers riding Timblin pipe into the winner’s circle. There’s about a dozen of Walter’s chassis racing “across the pond” and Walter has been from Doha to Qatar to see his machines perform: in person. From here in, we’ll give you the shop tour of Timblin Chassis, located at 18 Timblin Road, Baxley, Ga, 31531. You’ll find a cotton field across the street, the peanuts growing in the fields nearby, and fresh pecans falling off the trees in the orchard out back of his shop. He’s located in God’s Country down south, where hospitality and manners count for a lot. 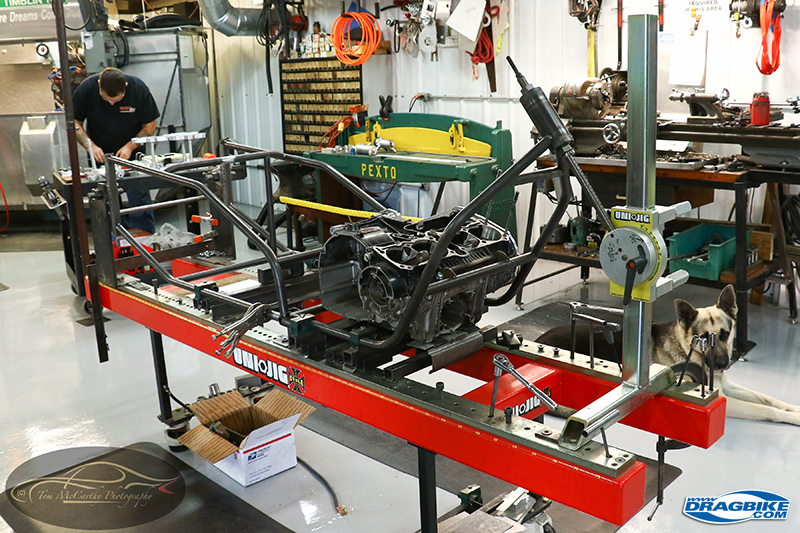 Every Timblin chassis starts off life as straight pipe from the stock rack and Walter bends his tubes and sets them into his jig with great care. 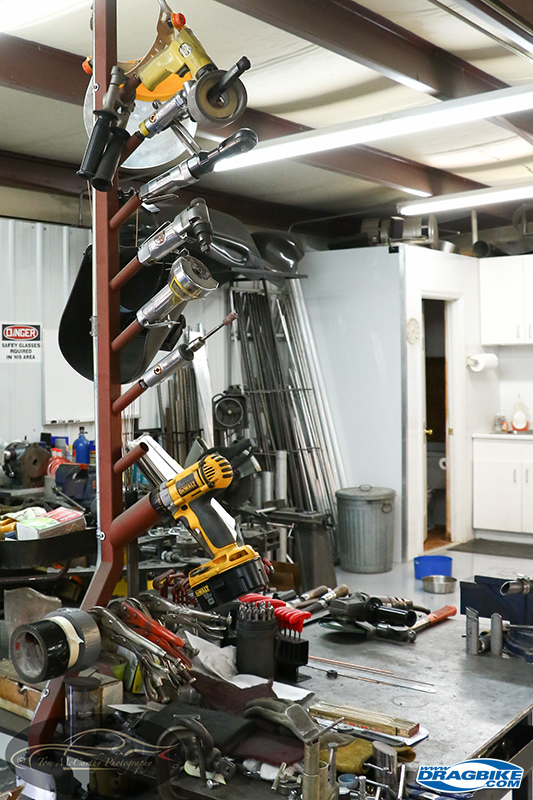 The “Tool Tree” on his general work table is a great idea that helps keep clutter off the table top and makes maximum use of the shop space. 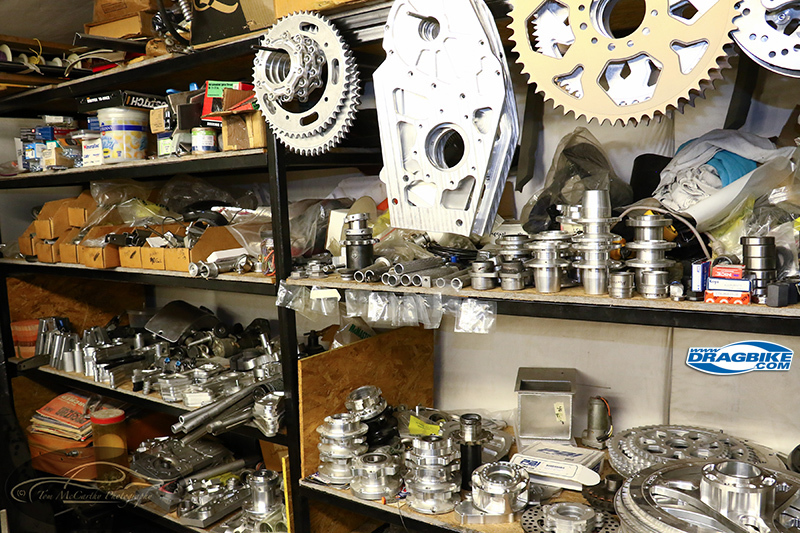 The back room is stocked with parts ready to ship. Walter has a good selection of PMFR parts and was a good friend with John, who used to own and operate PMFR. Can’t have a proper shop without a proper shop dog, this is Luke. 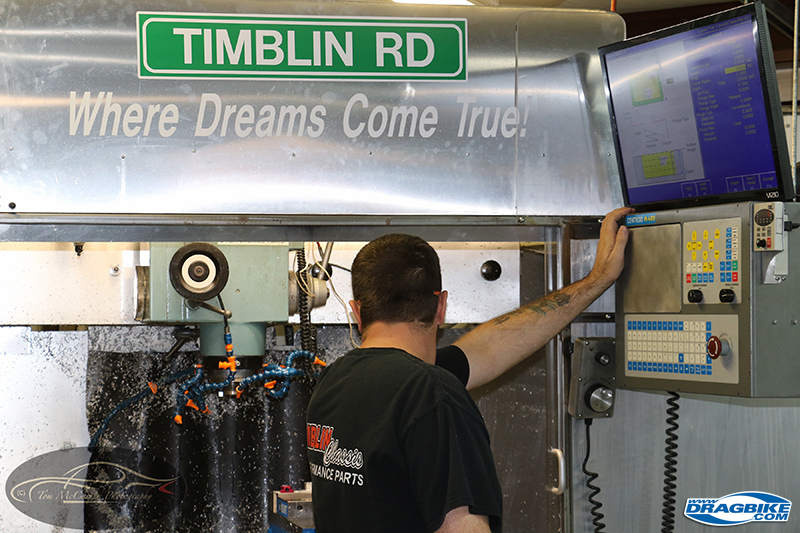 Many Timblin components are CNC machined right in house. He also uses stress analysis software to assess chassis modifications. Stuart Timblin is the lead machinist at Timblin Chassis; that he is an Army of One in this instance is of no consequence to this job title. 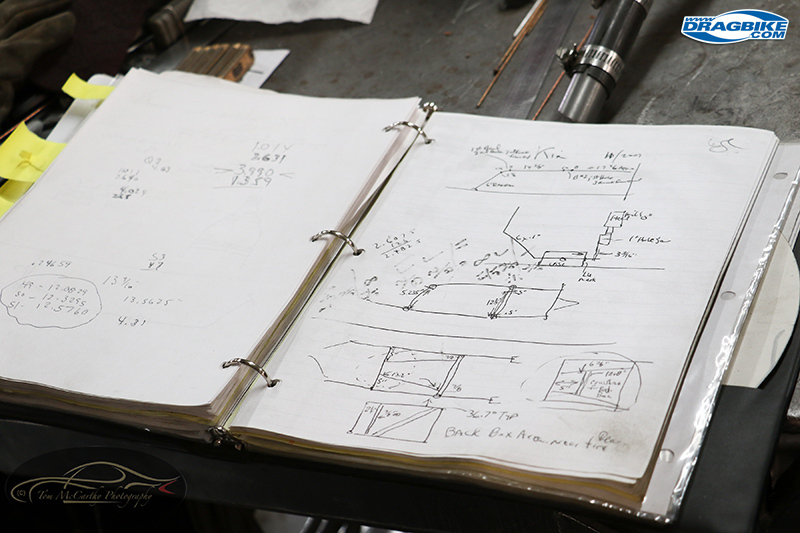 Many of the chassis creations, that Walter hand crafts, have sketch drawings. Keeping them in a three-ring-binder is a great idea. When was the last time anyone ran a ’36 Chevy sedan through the wind tunnel?Legendary NASCAR crew chief Ray Evernham likely became the first engineer in history to ponder the topic with the creation of his latest project, “The Ghost.” Unveiled at the SEMA Show on Wednesday morning, The Ghost embodies the most important attributes of motorsports and car couture to the soon-to-be Hall of Famer.A product of the 60-year-old’s imagination, The Ghost combines his admiration for old-school automotive styling and aesthetics with his knowledge and access to modern-day technology and performance.But put in simpler terms, The Ghost is the answer to a question: What would a modern-day modified stock car look like?The Ghost is a custom-built race car designed to look like a modified that would have been raced in the 1960s but features state-of-the-art mechanics and electronics.Born and raised in upstate New Jersey, Evernham is a child of the northeastern NASCAR Modified culture. He grew up competing on tracks like Wall Stadium and Flemington Raceway and won seven features at Wall from 1976-1981. Thus, The Ghost is Evernham’s full-circle moment.”The Ghost is this crazy idea I had from 40 years of racing, 40 years of building cars,” Evernham said. “I wanted to build something to just build it. I didn’t want to build something to a certain set of rules or specifications. And I didn’t want to use CAD technology, but rather build it from our own experiences in an old-school way.”It’s named The Ghost due to the pearl white Axalta-provided paint scheme. The car was built on a relative budget and primarily funded by Valvoline. Each contingency sponsor represented on the side of the car offered a discounted part or participated in its creation.Evernham plans to race the car himself, while placing other professional drivers behind the wheel to push the car to its limits. While it has the appearance of a 1936 Chevrolet sedan, The Ghost has the underbody of an Indy car. 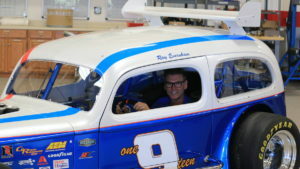 “This was my favorite kind of modified as a kid,” Evernham said. “I used to watch these cars as a kid. Now the chassis is a combination of a current NASCAR Modified car, a Trans-Am car and a little bit of a Cup Series car. The chassis was custom-designed and built from the ground up by Evernham and his team at the Big Iron Garage the old-fashioned way, without any help from computers. The car was constructed with a wide range of adjustability so it can be set up to compete on different types of tracks, including ovals, road courses, drag strips and hill climbs. Due to the lack of computer simulation work, Evernham doesn’t have exact downforce figures, because again, why would anyone take a 1930s modified to the wind tunnel? But Evernham does plan to put his latest creation through one before taking it on a slate of 2018 vintage events at Road Atlanta, Indianapolis Motor Speedway, Pikes Peak and more. But beyond personal satisfaction, Evernham hopes to turn heads at SEMA and beyond. “In a perfect world, someone sees this at SEMA or (the Performance Racing Industry trade show) and wants us to build one,” Evernham said. “As much as I like coming to work every day and just creating whatever comes to mind, we need to run a business too. The complete specifications of The Ghost can be viewed below. The couple hundred sunscreen-slathered and boonie-hat-wearing men and women that were gathered around the SCTA (Southern California Timing Association) trailer for the driver meeting had recently moved to the starting line for Speed Week’s long course. George Poteet had just officially been awarded the HOT ROD trophy, which has been given to the fastest single flying mile at Speed Week each year of competition since 1949. George Poteet knows the secret to Speed Demon’s success, “The whole team gets credit for what we do. You can’t do it without people.” From left to right, Aron Cranford, Steve Watt, George Poteet, Kenny Duttweiler, David Diviak, and Greg Pyles, all original members and ten-year veterans of the Speed Demon team. For several teams, taking the trophy comes second on their list of goals only to setting a record, if at all. George and the Speed Demon team had earned the trophy at Speed Week 2016 with a 429.099mph pass. It may seem odd to award the trophy a year after winning, but the driver meeting is the only time each Speed Week where most of the teams and spectators congregate in one place. It marked the sixth consecutive Speed Week that George and the Speed Demon team had claimed the honor, a singular feat in the trophy’s history. It was just after 10:00am and Speed Demon was lined up to make the first pass on the untried salt surface, packing the largest and most powerful of the four engines in its arsenal. Rumor was that the salt was better than last year, so hopes were high. Immediately behind the golden, aircraft-sleek streamliner sat Danny Thompson’s Challenger II streamliner, last year’s runner-up for the HOT ROD trophy and the only other car last year, besides Speed Demon, that managed a pass at more than 400mph. In contrast to Speed Demon, Danny Thompson’s ride shows off its 1960s heritage with a blockier design and retro lettering. Park it on the salt by itself and it’s a time machine to when Danny’s father, Mickey Thompson, campaigned the car in 1968. George fired up the twin-turbo, 441ci LS V8 and got the go-ahead from SCTA starter Jim Jensen. Ron Main, behind the wheel of his Ford Super Duty, pushed George away from the starting line, kicking up a small rooster tail of salt. As George engaged the clutch in first gear we heard the V8 rev and propel the car toward the horizon and out of sight. We moved toward the small crowd gathered at the starting line and strained to hear the announcement from the nearest spectator’s radio. . . 312mph at the two and a quarter. . . 336mph at the mile. . . 367mph at the four. . . 418mph at mile five! The excitement hadn’t even died down minutes later when Danny Thompson fired up his twin, nitromethane-burning Hemi V8s. Danny had only a handful of passes in Challenger II, including its best ever 411mph pass from Speed Week 2016. This time however, both engines were burning an extra 10% more nitromethane, about 83-84% total. If George’s 418mph run had put any pressure on Danny Thompson, he didn’t show it. Danny was judicious with the throttle and never opened the twin Hemi V8s all the way and still clocked in a 435.735mph pass, which would stand as the fastest run of the day, putting Challenger II in the lead for the trophy. We stopped by the Speed Demon pits on Saturday to ask about their plan for the rest of the week. George was happy to have qualified for Al Teague’s long-standing A/BFS record of 409.98mph, although he told us that easing into the throttle cost some speed early in the run. “I was being chickensh*t,” he confessed. Despite the course’s five-mile length, the Speed Demon crew often compares a run to a drag race; a bad launch can’t be overcome. Getting Speed Demon up to full throttle early would be essential. Speed Demon’s engine chief Kenny Duttweiler mentioned their plan to turn the boost up a bit for their return run. As both Challenger II and Speed Demon qualified for records, both were in impound and ready to run early Sunday. The Speed Demon team improved, running 428.784mph in mile five of the course, besting the 409.986mph A/Blow Fuel Streamliner (BFS) record previously set by Al Teague in 1991, with a two-run average of 423.521mph. What the timeslip didn’t reveal was how bumpy the course was. Teams desperately trying to put power down throw up a rooster tail and leave small ruts on the course, and that means George has to work to keep the car on the course. Back in the pit, celebrating the team’s new record, George told the team how close they’d come to missing the record. By the end of the run, he had the steering yoke locked to the left to keep Speed Demon on course, and even veered off course between the 4¾-mile marker and the final trap at the course’s end. Team tuner Shane Tecklenburg showed us onboard video of the streamliner passing by the 5-mile marker close enough that George could have reached out and touched it. Despite the tremendous driving, Danny’s 435.735mph in the fifth mile of the course remained the highest speed of the meet. Danny Thompson’s Sunday run did not secure a record. With virtually no explanation, an engine failure on one of his twin Hemi V8s took the car out of competition. The block survived, the cam was undamaged, and the team had spare parts. However, after a brief debate on whether or not the engine could run again later in the week, the team decided that another, similar part failure could truly hurt the team’s chances of competing with the car at later events. They did get lucky that nothing major was damaged. As far as catastrophic parts failures go, it could have been worse. They couldn’t guaranty that a similar failure would leave them with a mangled crankshaft, windowed block, or worse. Their Speed Week was over. They packed up their pits and Danny and his wife, Valerie, took Challenger II back to southern California to prep for World Finals in October. Valerie Thompson holds onto a container of shattered engine internals as Danny tells the Challenger II crew that they’re done racing for the week. George readies himself for the record return turn that would pry the 26-year-old A/Blown Fuel Streamliner record from Al Teague. The Speed Demon crew was still in the hunt for the HOT ROD trophy, but they ran into problems of their own. After their third run at more than 400mph in their 441ci A-class engine, the team decided to run their go-to powerplant, the 368.8ci C-class small-block. The engine had always been a solid performer and seemed like their best shot at besting Challenger II’s 435mph run. Less than two and a half hours after making a 410mph run with the A-class engine, the C-class engine tripped the beams with a 402mph exit speed. Not only had the engine not delivered the speed the team needed, the front main seal had an oil leak that caused a small fire. Because the team had yet another spare engine on hand, a 388ci B-class small-block, they decided that it would be faster to swap engines rather than pull, repair, and reinstall the leaky engine. The crew geared up for their second engine swap of the day, but thanks to the clever design changes made to this, the second version of Speed Demon, engine changes happen much more smoothly and quickly than before. We’ll explain more later. Efficient work from the team the day before had the engine ready to go for an early run on Tuesday, and George ran full throttle through the 5-mile course with a mile speed of 415.426 and an exit speed of 427.237, proving that the Speed Demon was still pulling at the end. Yet now there was a bigger problem. Early in the run the Speed Demon’s engine caught on fire. The engine was still running at 9,300rpm at the five-mile mark when George pulled the parachute. It was right about then that the fire’s damage to the wiring finally caught up to it and the engine died. When the engine kill switch is pressed in Speed Demon’s cockpit, water from the intercooler is automatically pumped onto the engine. The idea was that by the time the car gets back to the pits, the engine is cool enough for the crew to begin work. It also has the added benefit of putting out fires without calling on the aerosol fire suppression system. George was fine, the engine survived relatively unscathed, and so did the carbon fiber bodywork, but the wiring harness was a charred mess along with plenty of plumbing and one of the team’s Liberty transmissions. The Speed Demon team was undeterred. While Greg Pyles worked diligently to reconstruct a wiring harness identical to the one he’d originally built for the car, the remainder of the crew took on the daunting task of pulling the engine, swapping transmissions, repairing fire damage, and readying the C-class engine for another pass on the salt. The wiring took the brunt of the damage from the fire. Greg Pyles (WiredByG.com) spent the bulk of his Tuesday on the salt rebuilding Speed Demon’s wiring harness. As the wiring was damaged, the engine backfired, blowing up the charge cooler. Speed Demon fabricator Aron Cranford fired up his TIG torch and welded it back up after beating and bending the 3/16-inch aluminum back into shape. Engine builder and boost wizard Kenny Duttweiler works with Shane Tecklenburg as they go over data and plan their attack for the following day. Racers try their best to get their records early in the week. Bonneville’s track surface typically doesn’t get better than it is Saturday morning. By Wednesday morning, the hundreds of passes have taken their toll, leaving ruts and divots, and it only gets worse as the day winds on and the morning dampness that keeps the salt packed evaporates as temperatures climb and the breeze picks up in the afternoon. For engines, mornings also mean cooler, denser air and more power. Power is less of a problem than traction for many teams, but in a speed contest where records are measured to the thousandth of a second, competitors try to get every advantage they can. Helping to minimize the effect of warmer, less dense atmosphere, Speed Demon uses the same pair of Precision Pro Mod 88 turbos to supply boost regardless of which of the four Chevy small-blocks is installed. As engine co-crew chief Kenny Duttweiler is fond of saying, “We bring our own air.” Still, Speed Demon is not immune to the effects of warmer weather and typically try to run early in the day. The extensive fire damage kept the Speed Demon team busy and it wasn’t until Wednesday afternoon that the team was in the staging lanes and nearly ready for a run. A last-minute check revealed a leaky brake caliper. It would be a quick fix, provided the team had the proper O-ring. It didn’t. A single part that cost less than a buck was keeping them from running. A call was made out over the radio for any help with parts, but that late on Wednesday afternoon, most of the teams had either broken records of broken their machines and headed home. Even if they hadn’t, many retreated to Wendover for some air conditioned relief from the dry, baking salt. By chance, the one hardware store in nearby Wendover, Nevada, had the right part, but now it was late. George said it was the “absolute worst possible conditions we could have picked. We didn’t even know if it would run.” Pulling away from the push truck, the computer warned George there was a problem with the #5 cylinder, but George decided it was running too well for that to be the case. He powered on. At 5:43 on Wednesday, George Poteet piloted Speed Demon to a 438.643mph pass in the fifth mile of the course to take the HOT ROD trophy for an astounding 7thstraight time. Alex “Lil’ G” Pyles excitedly relayed the trophy-winning timeslip with its 438.643mph run in mile five. Once Speed Week had wrapped up, we spoke with George about what it meant to win the trophy. “I don’t say that it was my goal to get the HOT ROD trophy, but after you get it one time, you don’t want to give it up. You get to looking at the names that are on there and the number of times they’re on there, like Al Teague. It’d be nice to get it as many times as he did. . . That’s something that will be there forever. You can look at the people that have won, it’s a pretty good crowd to be in, in my opinion. I never dreamed I would be in that crowd, but I’m very grateful that I am now. Speed Demon is an evolution of the car that Ron Main was running when he and George Poteet first became partners. It was called FlatFire then, and was the first and still only flathead-powered car to reach 300mph. Ron suggested a partnership that would put George in the car with a new GM Ecotec four-cylinder. Naturally the car’s name changed to EcoFire and George had success piloting it to an F/BFS record at 325.934. In the meantime, George commissioned Troy Trepanier and Rad Rides by Troy to build him a Competition Coupe using an A-body Barracuda and powered by a four-cylinder Mopar sprint car engine. They called the car Blowfish. Shortly after Blowfish debuted, George and Ron retired the FlatFire/Ecofire car and part of its design was used to build a car that could take them even faster. Master engine builder Kenny Duttweiler built a turbocharged Mopar sprint car four-cylinder, just like the one found in Blowfish. Because the sprint car engine was known as Hellfire, the new car was christened Speed Demon. With the blown four-cylinder, Speed Demon was running in the 390mph range, but Kenny Duttweiler convinced George that a small-block V8 could push them into the 400s. That version of Speed Demon helped the team capture the HOT ROD trophy five consecutive times, beginning in 2009. After George Poteet walked away from a high-speed crash in 2014 that demolished the first iteration of the car, the Speed Demon crew rebuilt it from scratch, improving it along the way with the lessons gleaned from seven years of racing. Here are just some of the interesting aspects of the build. Bonneville’s long course is 150-feet wide and has five measured miles and three or more miles for shutdown. The first mile isn’t timed, and speed is measured over the next four miles, with additional time measured at the 2¼ and the exit speed at the 132 feet immediately before the five-mile mark. The four flying mile times are official and any one may be used to qualify for a record. The remaining two times, the 2 ¼ often referred to as the “quarter”, and the exit speed are only for reference. The difference between the 2 and the 2 ¼ speed give an indication of early acceleration while exit speed lets the team know if the car has reached its potential or is still accelerating. To qualify for a record, the speed in any of the timed miles has to exceed an existing record by at least .001 mph. Once qualified, cars proceed to impound and wait to run the following morning. For the record return run, only the mile that qualified for the record matters. For example, if a car qualified for a record in mile five, only the mile five speed is counted, even if the mile four speed on the return run was faster. A record return run cannot be used to qualify for a record. 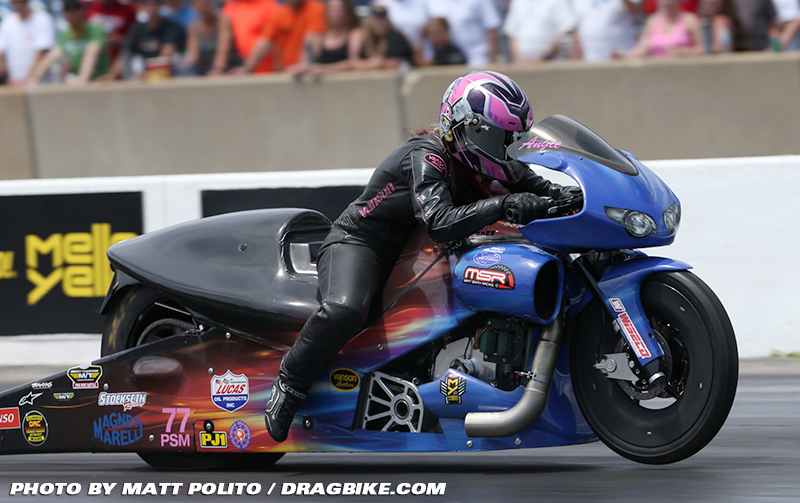 The NHRA Pro Stock Motorcycle drag racing series is the pinnacle rung of professional motorcycle drag racing. 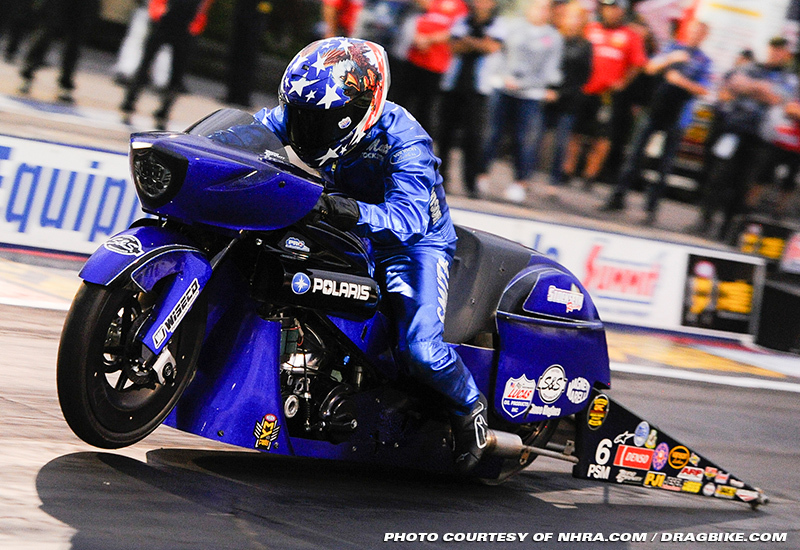 We caught up with two-time NHRA Pro Stock Motorcycle National Champion, Matt Smith, to see what really goes into building and racing one of these extreme, two-wheeled machines. Let’s start off with how these bikes look. 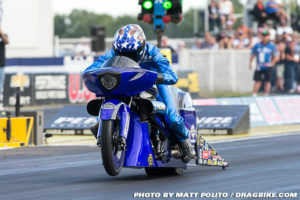 When you see a NHRA Pro Stock motorcycle, the first thing that grabs your attention is its low-slung, long-wheelbase presence. This is because the frame is a custom-fabricated unit built specifically for the job. The frame Matt Smith uses for his bike is made from 4130 chromoly steel, which has been welded together by Dog Fabrication & Design out of Mooresville, North Carolina. The swooping, streamlined bodywork mimics a production Victory Magnum motorcycle and is made completely from carbon fiber, courtesy of the composite masters at Kenny’s Components. The airbox and throttle bodies are located where you would normally find the gas tank on a production bike. The gas tank on Matt’s bike is an aluminum fuel cell nestled in the frame behind the engine. There is no rear suspension on Matt’s bike, but a giant, 10-inch-wide Mickey Thompson rear tire allows the bike to find massive amounts of grip. The front of the bike, on the other hand, still has some damping to help control this wild steed. A front inverted fork made by Traxxion Dynamics keeps the handling in check. When you reach the near-200 MPH speeds that these bikes are capable of, being able to stop becomes increasingly more important. Performance Machine brake calipers and rotors are fitted to the front and rear of the bike to take care of the intense stopping duties. So, you may be thinking, “Why is the racing class called “Pro Stock” if there isn’t anything stock about the bike?” Well, the most critical part of the bike – the engine – is stock. Sort of. Alright, so it’s not stock at all. The engine is only “stock” because its mechanical configuration is similar to a production bike’s engine. For example, on Matt’s bike, the engine must be a pushrod-operated V-Twin. This is because his bike is representative of a Victory production motorcycle. Victory motorcycles, in showroom-fresh guise, have large-displacement twin-cylinder engines. The pistons cycle in a “V” orientation and the engine utilizes pushrods to operate the valve train. However, this is where the similarities between “Stock” and “Pro Stock” end. The engine fitted to Matt’s race bike is a brand-new design which was created in collaboration with S&S Cycles. Matt played a crucial part in the development process of this engine. Where a stock Victory engine has a displacement of 106 cubic inches, Matt’s S&S race engine is punched out all the way 160 cubic inches. While a larger displacement certainly helps in finding extra power, it isn’t the only thing that’s going on inside this engine. The engine utilizes specially-designed S&S heads and camshafts. A set of Wiseco pistons handle the incredible combustion stresses found inside of this fire-breathing powerplant. 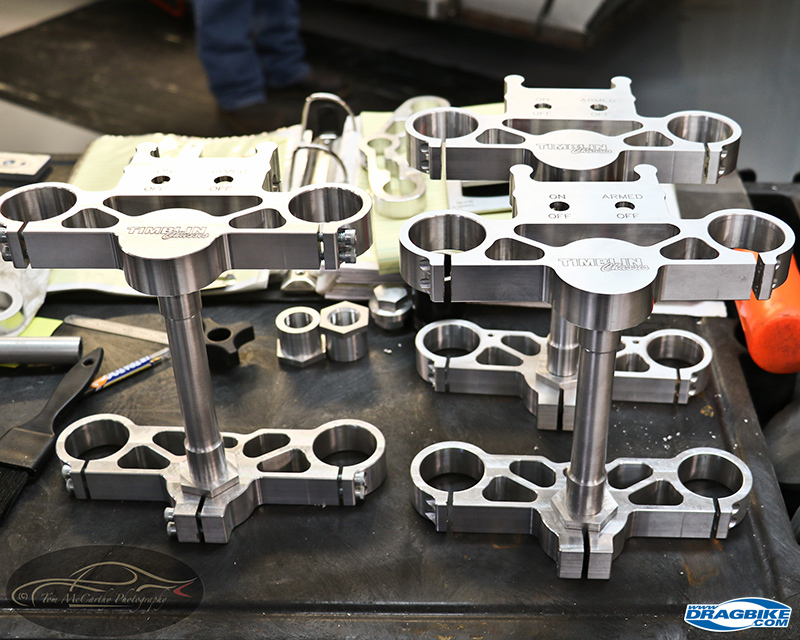 “We designed the pistons with Wiseco to fit our bore and our cylinder head. I’ve worked with Wiseco this year and I’ve not had one piston failure. I have five of these motors right now and they all have the same set of pistons that we started in January with. I think that speaks volumes – we haven’t had to replace anything,” Matt says. That feat alone is incredible. You see, these race engines don’t exactly live pampered lives. They are asked to perform at their upper-most mechanical limits race-in and race-out. Where a stock production engine redlines at 5,500 RPM, Matt’s engine can go in excess of 10,000 RPM. A stock Victory 106 cubic inch engine puts out around 88 horsepower and 106 lb-ft of torque. But on Matt’s pro stock race bike? “This is the first year for this engine so we’re still making progress with it. The last time we went on the dyno and we made 338 horsepower at the rear tire,” Matt states. Paired to that stratospheric horsepower number is a torque readout of 215 lb-ft.
Constructing a bike like Matt’s is an ongoing pursuit of tuning, modifying, and refining. Improvements are constantly being made to ensure that the machine stays competitive on the track. Matt is an experienced mechanic as well as racer, and does some of the fabrication and mechanical work himself. However, he also employs the help of a few professional mechanics. 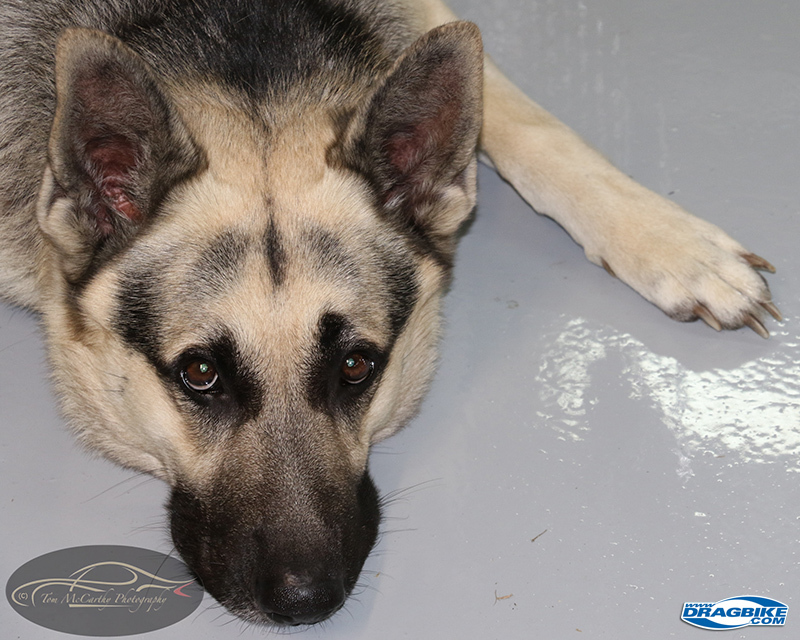 “We have a cylinder head guy who’s always at home, working on cylinder heads to find us more power. We have another guy that travels with us that works on the bikes full-time. We have two part-time guys that we fly in every race to help work on the motorcycles,” Matt says. As you can see, it takes a team of professionals to keep the bikes in check from race to race. At any given time, Matt’s team has two complete race bikes ready to roll. This ensures that if anything goes awry with the first bike during a race weekend, there is another bike on standby to finish the job. You have to wonder what it’s like to ride one of these ridiculously powerful machines. Well, there’s no better person to ask than someone who does it for a career: Matt Smith. With sixteen races in a season, that is the attitude you must have toward such an adrenaline-packed profession. With a bike that’s in tip-top mechanical condition, there’s only one thing left to complete the race-winning formula: a rider that finds it is only second nature to go fast.